Note: This post is now outdated. 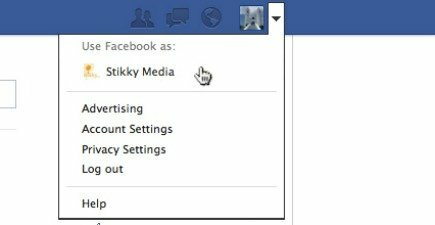 The new Facebook business page doesn't allow for people's posts to appear on a business' page timeline. However, you can always make these posts more visible to your visitors and fans. Here's how. Those were the good old days. 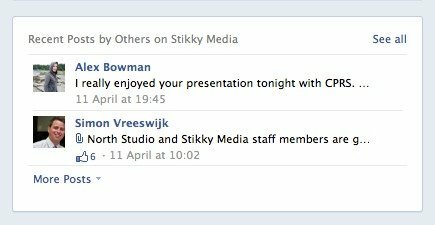 Now, thanks to Facebook Timeline, that community engagement is swept off your page and tucked away in a tiny Recent Posts by Others box, where nobody will ever see it. Not exactly good for business. So how do you bring those Recent Posts by Others back onto your Timeline where they belong? In the most counter-intuitive way possible. 1. Make sure you are using Facebook as the Page, not as your personal account. 2. 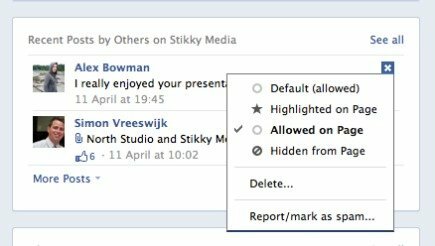 Locate your Recent Posts by Others box on your Timeline. It’s the one with the really tiny grey font that you can barely read. 3. Hover over one of the posts, then hover over the "X." See how it says "Remove"? That’s a lie. Click it. 4. An unexpected drop down menu will appear. That’s It! There’s no way to set up your page so it automatically transfers these posts to your Timeline in real time, so manual intervention is the only way to go about it. Thanks Facebook, for making this simple task as difficult as possible.